Ta` Ceppuna chapel, which dates back to the 15th century. The chapel was renovated and restored in collaboration with Din l-Art Helwa in the mid-1990s. Although its origins are unknown, Dr Buhagiar believes that stylistic considerations suggest it dates back to the late 15th century. Like other late medieval Maltese churches, Ceppuna is a small cube enclosing a single box-like cell divided into bays by two acutely pointed arches rising from wall-piers. The roof is slightly pitched and rainwater runs off through characteristic water spouts. Architecturally, Dr Buhagiar describes it as "an uninspiring little building, remarkable only for an uncompromising severity of treatment that assiduously excludes all ornament except for the plain moulding that decorates the arched altar-recess at the east end". The walls have an outer and inner skin with an infilling of rubble. Dr Buhagiar speculates that the chapel may have been built by one of its rich proprietors as a church where hunting parties could hear Mass and attend to their devotions before indulging in their favourite sport. The chapel's greatest claim to fame was when, the day after the death of Grand Master Philip Villiers de l'Isle Adam on August 26, 1534, the funeral procession left the convent of Santa Maria del Gesù outside Mdina and stopped at Ceppuna where his body was left overnight. The following morning the procession with the body of the valiant defender of Rhodes and Malta's first Grand Master, resumed with greater pomp to Birgu, where he was buried in the church of St Anne at Fort St Angelo. In 1565 the Ceppuna chapel was inspected by the Apostolic Visitor, Mgr Pietro Dusina, who noted that it was dedicated to the Assumption of the Virgin and was adequately furnished for the celebration of divine service. He recorded, besides, that it stood on lands pertaining to the Grand Master. The chapel remained in a fair state of preservation until World War II, when it suffered considerable damage. It was subsequently repaired and the west front had to be almost entirely rebuilt. It then fell into neglect and became a target for vandals, who broke open the door and reduced it to an almost derelict building. Its continued survival, Dr Buhagiar concludes, was in the balance until the Marsa Sports Club's Main Committee came to the rescue and had it sensitively restored. "This is a laudable gesture which deserves the applause of all those who have the preservation of Malta's artistic and historical heritage at heart." 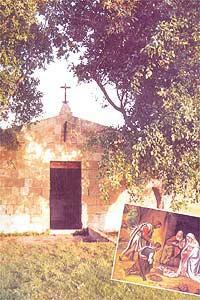 * Buhagiar M., "The Ceppuna Chapel in the Grounds of the Marsa Sports Club", Marsa Sports Club magazine, Christmas 1996.